Do you love Korean barbecue and cheese as much as your special someone? Well, this Valentine’s, you can now have a cheesy Korean barbecue feast with bae while on a premium dining experience that doesn’t break the bank. The Korean barbecue-cheese fondue combination is all the craze right now, so on February 14th, Valentine’s Day, premium Korean barbecue place Gen Korean BBQ House will be launching their new menu, featuring a cheese fondue set. The perfect reason to go on the cheesiest date ever! ALSO READ: LOOK: This Korean BBQ House Offers…Red Wine Samgyupsal! 3. Their cheese fondue is made with béchamel sauce, making it extra creamy. 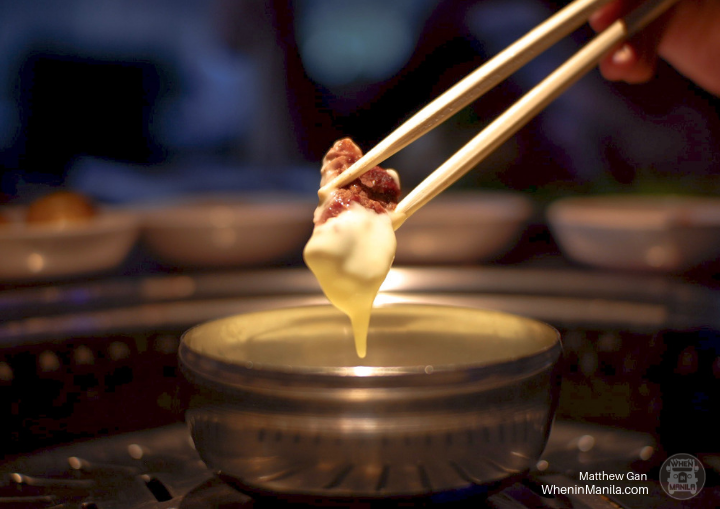 At Gen Korean BBQ, unlike in other Korean barbecue places, there’s no need to melt the cheese anymore as theirs is served as fondue. Plus, the fondue is made with cheddar cheese and béchamel sauce that makes it even creamier. And as it is served melted, you can leave the cheese over the heat while grilling the meat, for an even cheesier result. 2. There are lots of meats to choose from to pair with the cheese fondue. Gen Korean BBQ House offers 35 premium meat choices like samgyupsal, bulgogi, steak, chicken, and even seafood such as shrimp and calamari that you can pair up with the cheese. It’s definitely worth it, as there a lot of meat choices and unique flavors to choose from. You’ll always find something here to satisfy your taste buds. From top to bottom: Red Wine Samgyupsal, Cajun Pork Belly, Plain Samgyupsal, Garlic Samgyupsal, Hawaiian Bacon, Premium Steak, Spicy Pork Bulgogi, Smoked Samgyupsal and Chadol. 1. They offer Premium Steak and different wine choices for you, too. that can make your experience more romantic and cheesier. To make your dining experience even more romantic and cheesier, Gen Korean BBQ House offers premium steaks in their choices of meats, along with different choices of wine. And yes, we’re not talking about just U.S. premium meats, we mean unlimited U.S. premium meats. And, for an additional PHP298 per person, you can have unlimited wine, too! So what are you waiting for? Dine this February at Gen Korean BBQ House to experience your cheesiest date ever. Does 'Gossip Girl' Really Need a Reboot? New World Makati Hotel: Savour Australia!